A lot of makeup newbie often mistaken compact powder and loose powder. They think that these two products are the same, except that the loose powder gives lighter coverage. Because of that, most of them ended up purchasing the loose powder because they thought it wouldn't give them a major change of look. Compact powder and loose powder are two different products and they have different functions respectively. Sometimes known as two-way cake, compact foundation, twin cake or pressed powder. They all mean the same. Compact powder provides coverage to your skin. It helps you hide imperfections and even out your skintone. After applying the compact powder, it will gradually blend with your natural face oil to create a flawless look on your skin. If the compact powder doesn't blend with your face oil, then the product doesn't suit your skin or it is simply lack of quality. You can tell if it doesn't blend well when the compact powder gets cakey. Sometimes known as translucent powder or setting powder is a powder that you dust on top of your foundation to prevent it from running. It helps to absorb oil (as opposed to compact powder that blends with oil) to preserve your makeup longer. On days that you don't want to wear makeup, you can use this on top of your moisturizer to remove that shiny effect. Basically, the loose powder job is to give your face a matte texture. 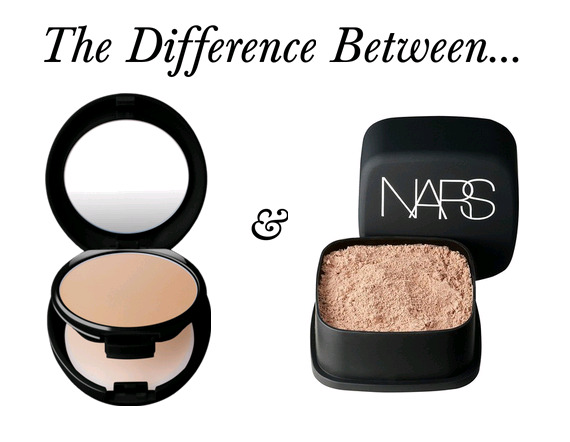 Have you ever wonder what's the difference between compact and loose powder? Or did you thought they are the same product? Let me know if today's discussion have help you. If you have any questions, comments or tips, do share with me on the comments below. P/S: I can't believe we are still discussing about face makeup after so many weeks. We still have a lot of other topics to cover - eye makeup, lip color, tools, etc. I wish I have more time to blog on this topic, but bear with me. We will get through all of it. If you have any urgent makeup basics questions, you can always email me. I love it when we talk about face topic~ because for me what's important is the base haha :D looking forward for more! I know they are different and I understand their functions very well hehe. Thanks for the efforts for helping make up newbies including me! that's means, loose powder can covered our oily skin better than compact powder.. am i right? Always love your make up tips and skin care tips. I know the difference between compact powder and loose powder but i just can't seem to get the right shade for my skin ._. Can we use compact compact powder after applying foundation?